The tunnel boring machine has been working its way through the mountain since September 2015. This open gripper machine is driving the stretch of exploratory tunnel between Ahrental, south of Innsbruck, and Pfons. There are about 5,000 metres left to Pfons and the TBM should reach its goal in Spring of 2019. On March 30th 2018, the 10,000 metre mark was reached. For the Brenner Basistunnel BBT SE company and the Tulfes-Pfons consortium (Strabag/Salini-Impregilo), reaching this mark was a special event. In May 2017, the gripper TBM excavated 61.04 metres in 24 hours through quartz phyllite rock, a world first.. 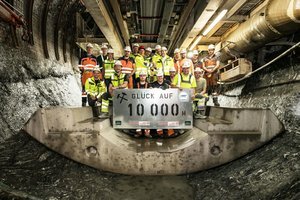 The excavation team were delighted with this excellent performance, because with it they broke the standing record of the two Swiss tunnels - 52 metres in the Lötschberg and 56 metres in the Gotthard Base Tunnels. The machine officially known as „Hartgesteins Gripper BM S-932“ is about 200 metres long and weighs 1,800 tons. Its connected load is 5,500 Kilowatt, meaning just under 7,500 horsepower. It is moving through phyllite and schist southwards to the Brenner. The most important part of this high-technology underground logistics plant is its cutter head. It has a diameter of just under 8 metres and has 42 cutters and 6 spoil removers. The chisels break the rock into small pieces. The spoil removers shift the rock behind the cutter head. From there, conveyor belts carry the spoil automatically out of the tunnel to the disposal site. A particularity of the Brenner Base Tunnel is the use of a Multiservice Vehicle (MSV) – an innovative, self-driving supply train on wheels which is being used for the first time in the world on the construction site in Ahrental. Its job is to supply the tunnel boring machine with construction materials. The works for the 64-kilometre Brenner Base Tunnel are ongoing at several construction sites at the same time both in Austria and in Italy. By the end of March 2018, the miners had excavated over 80 km, meaning a good third of the total 230 kilometres of tunnels. So far, 23 kilometres of main tunnels, almost 30 kilometres - half - of the exploratory tunnel and about 28 kilometres of access, rescue and logistics tunnels. 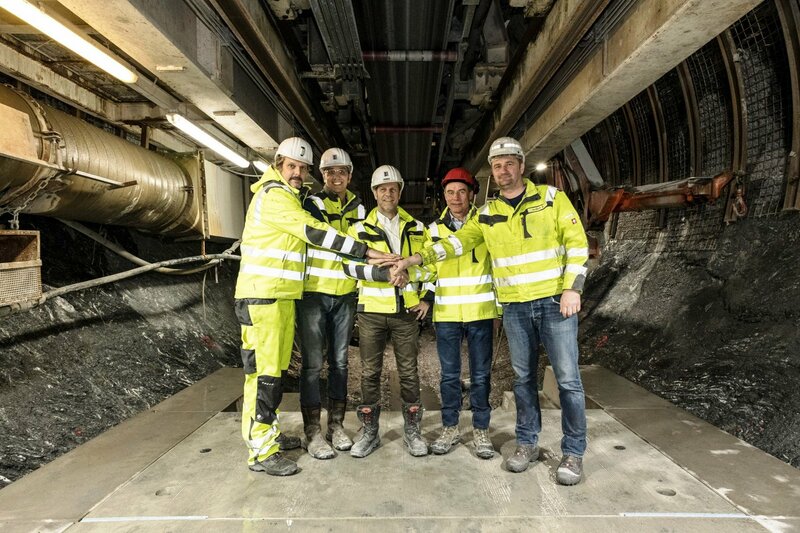 BU: The Brenner Base Tunnel: precise teamwork allows peak performance in building the longest underground railway connection in the world. Exultation among the miners in the Brenner Base Tunnel: the Tunnel Boring Machine has reached the 10,000 metre mark in the Ahrental exploratory tunnel. With 61 metres in 24 hours, a new world record has been set.